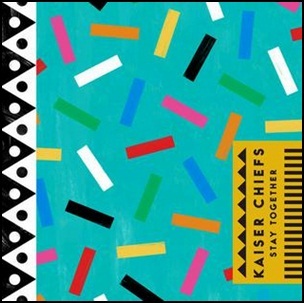 On October 7, 2016, “Fiction” label released “Stay Together”, the sixth Kaiser Chiefs studio album. It was recorded 2015 – 2016, and was produced by Brian Higgins, Ricky Wilson, Andrew “Whitey” White, Simon Rix, Nick “Peanut” Baines and Vijay Mistry. 20152016Andrew "Whitey" WhiteBrian HigginsFictionGood Clean FunHappen in a Heartbeathidden trackHigh SocietyHole in My SoulIndoor FireworkKaiser ChiefsLazor JamNick "Peanut" BainesOctober 7ParachutePress RewindRicky WilsonSimon Rixsixth albumStay TogetherStill WaitingSunday MorningVijay MistryWe Stay TogetherWhy Do You Do It to Me?